PACIS 2015 | ERCIS Competence Center "Service Science"
The 19th Pacific Asia Conference on Information Systems (PACIS 2015) will be held at Singapore, from 6th to 9th July 2015. PACIS provides a forum for researchers and practitioners working on all aspects of Information Systems. The prime purpose of the PACIS is to enable regional and international Information Systems researchers and practitioners to meet in an annual forum that maximizes the opportunity for quality information exchange. 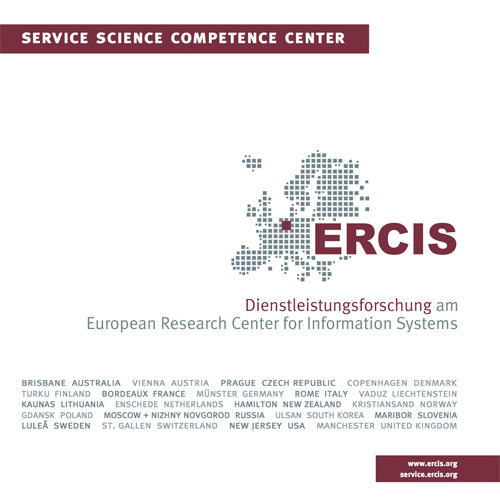 The ERCIS Service Science Competence Center will be involved at PACIS 2015 by supporting the track on "Service Science and IS". The track is chaired by Heng Cheng Suang (National University of Singapore), Ye Hua (University of Auckland) and Byron Keating (University of Canberra). Daniel Beverungen acts as an associate editor. Advances in information technologies (IT) have enabled multiple parties (e.g., customers, suppliers, and employees) to engage in the creation, delivery, and use of services. This not only changes the landscape of service business, but also affects the way that services are created, delivered, and consumed. With diversity in context and culture, research is needed to enhance our understanding of IT-enabled services. This track aims to encourage academic researchers worldwide to advance our knowledge on IT-enabled services. We invite research papers that develop or extend theory and practice on how IT is supporting, enabling and transforming services in today's digital world. Research of conceptual, analytical, or empirical nature is welcome.